mwe3: How did the new UNIT CD take shape and what was it like working with Brazilian singer-songwriter Luiz Murá? Seems like the new Unit CD with Luiz is an interesting cross between jazz fusion and Brazilian music. What did you set out to achieve with this new CD? 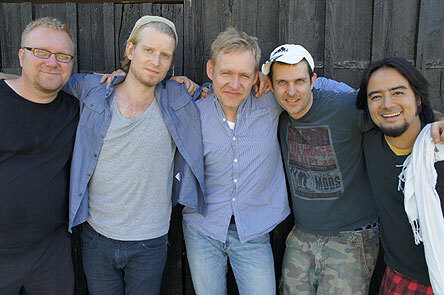 Niclas Höglind: Kristofer and I met Luiz thru our mutual friend, guitarist Marcus Wiberg who just moved to Brazil. 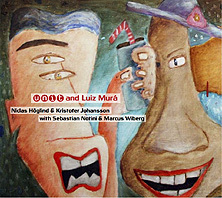 Marcus brought Luiz to Sweden and we made a few concerts together. We felt right away that our sound and playing worked really well with Luiz music and we decided to make an album together. We also contacted the Swedish percussionist Sebastian Notini who has spent the last 10 years in Brazil and really knows both worlds well. Usually Luiz had a tune or an idea that we all started to work on and add our different flavors to. The thing that made the process so much fun and creative was that we constantly tried new ideas, sounds and grooves until we formed something that felt like this cool Brazilian/Scandinavian music. Warm but still a bit melancholic. I think that Luizs voice and music works really well with that special mix, and that we all get the freedom to do our thing. For example the sounds and electronics that I love to use are still there but a lot more subtle than on our previous album Unit Jazz & World. mwe3: Whats your experience with Brazilian music and how does that sound fit in with the more Swedish based jazz fusion youre more familiar with? What other types of World Music are you interested in from Sweden and elsewhere? Niclas Höglind: I have always loved listening to Brazilian music and musicians inspired by Brazilian music. Unit also toured and recorded with Maucha Adnet who was one of the singers in Antonio Carlos Jobims group for over 10 years. This was a really great experience and so much fun. I think that a lot of the music on the ECM-label really reflects the fusion between jazz and Scandinavian folk music...if you listen to some of the recordings with, for example Keith Jarrett, Jan Garbarek, Palle Danielsson and Jon Christensen or John Abercrombie. The even 8th note feel in a lot of that music is quite close to some of the Brazilian music and still jazz with a nice vibe of Scandinavian folk music. Pat Metheny is another great musician and inspiration for me. When it comes to World music there is so much fantastic music made every day, but take for example Nils Petter Molvaer who mixes the electric and acoustic sound in a brilliant way. Or someone like Jon Hassell who has done this for decades. mwe3: What was the chemistry like between you and all the UNIT players from Sweden and what was the challenge recording music with a Brazilian singer and Brazilian lyrics? Who are some of your favorite Brazilian musicians and/or other favorite Brazilian music? Niclas Höglind: Recording together was really fun but challenging because we had less than a week to record and mix the whole album. This meant that we had to make quite quick decisions in the studio, but it worked out really well. We usually only had to do one or two takes before we where satisfied. Unfortunately I dont know any Portuguese but Luiz usually explained the lyrics for the songs so we could get the feel for what they were about. Some favorite Brazilian musicians are of course A.C. Jobim and Elis Regina and I also love Joao Bosco. mwe3: What guitars are you featuring on the new UNIT CD and what other guitars and guitarists from Sweden and elsewhere interest you most these days? 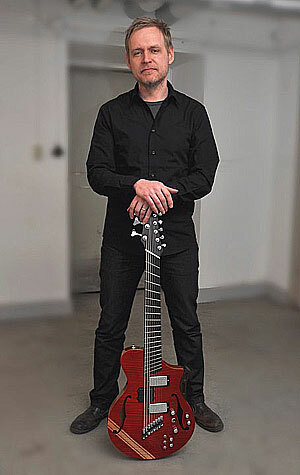 Niclas Höglind: Since I started to play 8-string guitar a few years back, this has become a part of my sound and I own three outstanding 8-strings made by Wes Lambe. www.wlguitars.com . I also frequently use my Klein electric, a really great sounding, comfortable and unique guitar. 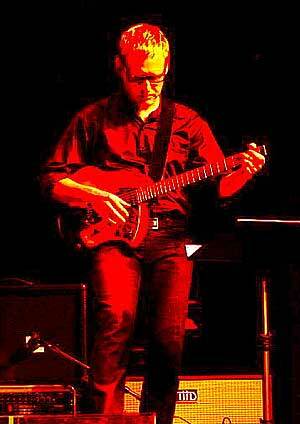 My Gibson ES-175 from 1960 was also used for the album. A wonderful guitar to play. I have some other guitars as well and among them a fantastic Gibson ES-335 from 1962 which sounds and feels amazing. Sweden is a country with many really good guitar players and musicians. It is a great inspiration whenever you get the chance to listen to, or work with the best of them. When it comes to guitar players that inspires me the list is long, but just to mention a few I love Ralph Towner, Allan Holdsworth, Pat Metheny, John Abercrombie, John Scofield, Wes Montgomery, Jeff Beck, Bill Frisell, Larry Carlton, The Edge and David Gilmour. I also have to mention Oz Noy, Tim Miller, Eivind Aarset, Ben Monder and Charlie Hunter who all are very unique and sound really great. There are many more of course. mwe3: Whats been the reaction in Sweden and Scandinavia to the UNIT CDs and whats some of the other latest news, musically and otherwise in Sweden? Hows the country doing these days? Have you seen Peder Nabo and Peter Bryngelsson of Ragnarök around lately? Niclas Höglind: We have had the chance to play some concerts and at a jazz festival and got really good response from the audience. The CD also got a really nice review in Lira, Scandinavias biggest magazine for World music. Musically Sweden is a great place, even if being a musician is really hard work anywhere, but as I mentioned earlier there are so many great players everywhere. Although I have to say that Im glad that finding new music on the internet is so easy today. It feels good to be able to share and find music and musicians that are into the same thing as you, even if they dont live anywhere near your part of the world. I met Peder Nabo of Ragnarök last summer and I hope we get the chance to work together again soon. It was great fun to do Nattens Prinsessa together. mwe3: What are your other plans musically moving forward and do you have some new and forthcoming projects coming in 2013? Any other music and/or other news youd like to bring to the readers attention? 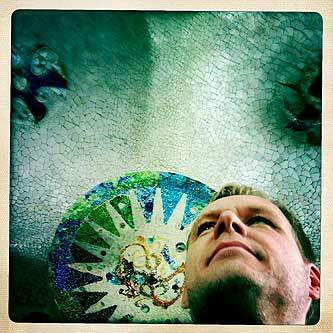 Niclas Höglind: 2013 will involve some touring with different projects, among them Unit & Luiz Murá. I will also be working on a new project together with bass player Mattias Welin and singer Cecilia Alriksson in our trio Fröjdeljud. We will arrange the music by Arvo Pärt for electric guitar, electronics, bass and voice. The music will be performed while 15 paintings by Marc Chagall will be shown. This is a real challenge and will be so much fun. I love Arvo Pärts music. Blekinge Jazz & World is a summer camp that Unit has been in charge of for 12 years now. It specializes in jazz, world music and live looping and is a really great week with musicians from all over the world. Always a great inspiration to be involved in. I also hope to get some time to work on my solo guitar live looping project which is something I also really enjoy doing.